It feels like an awfully long time since I've talked about a dressmaking project! I have been doing lots of sewing though (including starting my anorak!). This skirt is a lovely garment to talk about, as it's a way of clinging on to the festivities in this bleak late January weather! I made this skirt in December, and wore it on Christmas day (because what screams Christmas more than velvet?) and I really love it. It felt perfectly festive. I bought the fabric quite a while ago, when I visited Stoff and Stil. The great thing with a skirt like this is that it uses minimal fabric. I didn't have enough fabric to make a circle skirt, which would probably have been my first choice, but I actually really like the straight skirt. It was extremely simple to sew. I self drafted the pattern, and it couldn't have been easier: two rectangles sewn together and then folded down at the top to provide room for an elastic. I did still manage to make mistake though! I originally sewed the skirt with the pile going horizontally. It looked, as you can imagine, really odd! So I unpicked the whole thing, re-sewed it the right way, and am now much happier! This was really such an easy make, great to sew up in a couple of hours. 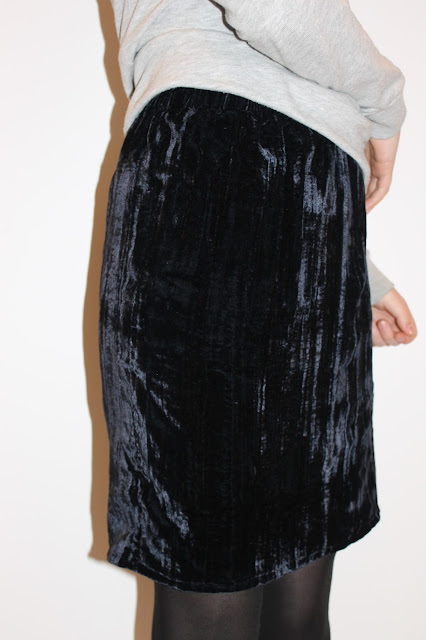 If you'd like to make one but would rather use a pattern, view b of the Dominique skirt looks great in velvet, although it has more of a flaring skirt. It was my first time sewing with velvet, and I love it so much! Although velvet is very much associated with Christmas and new year, I think it'll be the perfect thing to wear in January to remember the festive season. What a great skirt!! I LOVE the deep rich blue color, and you can't go wrong with velvet. I still have not jumped on trend yet, but am thinking about it, lol! Nice! I love the velvet and bravo on making your own pattern. Very beautiful. I love velvet. It's not fun unpicking stitches on velvet but at least you got it to look right.